One of the primary goals of field research is to document new species occurrences: discovering a new species or finding remains of a species where none had been found before. Most people think that naming a new species is the ultimate paleontological prize. 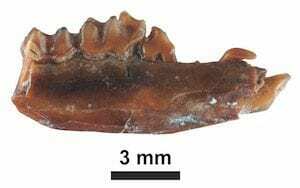 Although finding and naming new species is an exciting and important part of being a field paleontologist, integrating new species into the “big picture” is actually of greater scientific value. I am often asked whether the discoverer of a new species gets to name it. The short answer is “yes,” though there are a few caveats. First, to name a species, you have to do more than just discover it. You have to describe it. In other words, you need to write and publish a formal description of the animal in an academic journal or similar medium that follows all the rules set by the International Code for Zoological Nomenclature for how a new species must be named. If you do that then yes, you get to name the species whatever you want. However, it is bad form to name it after yourself, even if you discovered it. If someone else discovered the specimen, it is perfectly fine to name it after him or her. 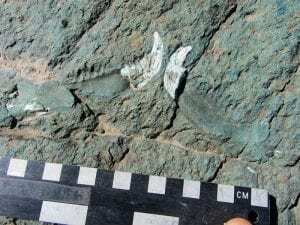 It is also common to name a species for where it was found, the geologic formation in which it was collected, or some distinctive feature of its anatomy. There are no rules about the derivation of a name – a new species can be named for a song or cartoonist or whatever you want – but you have to Latinize it, which usually means using particular types of endings. If there are several authors on a paper describing a new animal, then everyone much reach a consensus on what the new name should be. But within those bounds, there are no limits on what a species can be named. Listed below are the new species I have described along with some information about them. As is evident from this list, naming new species is usually a collaborative effort. Palatal view of the holotype skull, anterior to the right. Etymology: The genus is named after the Altiplano, where the Chucal Fauna is located; “typotherium” is a common suffix for mesotheriid genera. The species is named after Chucal. Lateral view of the holotype rostrum, anterior to the left. Etymology: The genus is named after the Altiplano, where the Chucal Fauna is located; “typotherium” is a common suffix for mesotheriid genera. The specific epithet means “few teeth” and refers to the characteristic lack of the third upper premolar in this species. 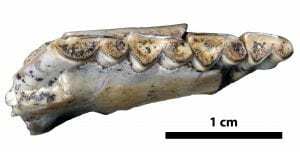 Lateral view of the holotype lower jaw (which includes the base of the incisor and most of the four cheek teeth), anterior to the right. Etymology: The genus is named for the Andes Mountains, where the fossil was found. The species epithet refers to Termas del Flaco, the town closest to the fossil locality of Tinguiririca. 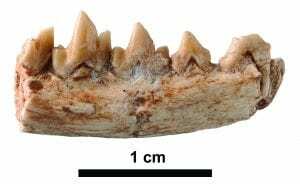 Occlusal view of the holotype upper jaw bearing six teeth, anterior to the right. Etymology: The genus was named by Santiago Roth in 1903. 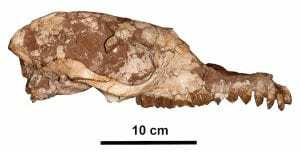 (Although the name includes “typotherium,” it is not a mesotheriid.) The specific epithet is named after Bryan Patterson, a well-known paleontologist who studied South American mammals. Palatal view of a cast of the holotype palate, anterior to the right. Etymology: The genus was named by Santiago Roth in 1903. (Even though the name includes “typotherium,” it is not a mesothere.) The specific epithet refers to Tinguiririca, the type locality. 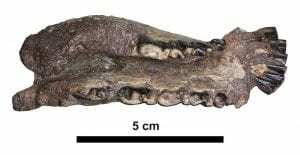 Lateral view of the holotype lower jaw, which preserves most of two premolars and three molars, anterior to the right. 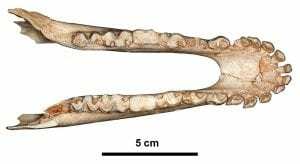 Etymology: The genus name means “southern weasel,” since this was a somewhat weasel-like mammal from South America, and the specific epithet means “slender jaw,” in reference to the form of the holotype. Reconstruction (by V. Simeonovski) compared to a modern water buffalo, a tamaraw, and a human. Etymology: The genus was named by Charles Hamilton-Smith in 1827. The species is named after Cebu Island, the type locality. Occlusal view of the holotype, a right upper second molar, anterior toward top of page. Etymology: The genus is named for the nearby Cachiyacu River and the Quechua (indigenous) word for guinea pig, cuy. The species is named after the nearby town of Contamana. Occlusal view of the right lower dentition, anterior to the right. Etymology: The genus is named for the nearby Cachiyacu River and the Quechua (indigenous) word for guinea pig, cuy. The species is named after Bernhard Kummel, a geologist who mapped the rocks in the area in the 1940s. Etymology: The genus is named for Canaan, a nearby indigenous (Shipibo) community; “mys” means mouse and is a common suffix for rodent genera. The species is named after Maquía, the area where the type locality is located. Etymology: The genus is named for Caragua; “typotherium” is a common suffix for mesotheriid genera. The species is named after Nelson Muñoz, the Chilean geologist who discovered the specimen. Occlusal view (photo above, line drawing below) of the left upper teeth of the holotype, anterior to left. Etymology: The genus combines Chile, the country where the holotype was found, with “stylops,” the common suffix for notostylopid names. The species is named for John Davidson, a geologist who made important studies of the area in the early 1970s. Lateral view of holotype dentary (preserving partial m2 and complete m3-4), anterior to right. Etymology: The genus name combines “Chimera,’ in reference to the mixture of features present in this species, with “lestes,” meaning robber or thief, a common suffix for palaeothentids. The specific epithet refers to its uncertain phylogenetic position in its family. 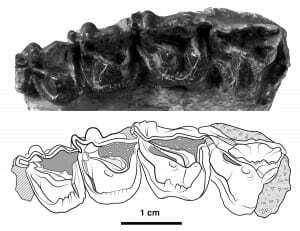 The holotype, two halves of the lower jaw, as it was found in the field. 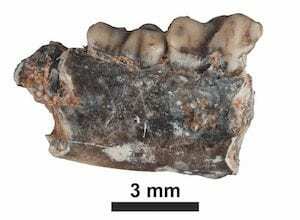 It mostly consists of natural molds, but the white areas are fossilized bone and teeth. Etymology: The genus name combines “Chloro” (green), in reference to the color of the sediments in which the specimen was found, and “cyon” (dog) a common suffix for sparassodonts. The specific epithet means “ghost” in Greek and alludes to the fact that the holotype is mostly a natural mold of the actual jaws. Oblique occlusal view of the left side of the holotype palate, anterior to the left. Etymology: The genus was named by Burmeister in 1885. The species is named after Volcán Antuco, a picturesque volcano near the fossil locality. Occlusal view of the right upper teeth of the holotype, anterior to the right (from Patterson 1934). Etymology: The genus is named for Elmer Riggs, who collected this and many other specimens for the Field Museum in 1924 as leader of the fist Marshall Field Expedition. The species is named after the museum and the expedition. Lateral view of the holotype partial cranium, anterior to the right. Etymology: The genus was named by Florentino Ameghino in 1901. The specific epithet honors Mariano Bond, an Argentine expert in native South American ungulates, particularly those of the Eocene and Oligocene. Occlusal view of the holotype lower jaw, anterior to right. Etymology: The genus was named by Florentino Ameghino in 1901. The specific epithet honors the US geologist Neil Opdyke. Occlusal view of a referred left upper jaw bearing 3.5 teeth (two premolars, and 1.5 molars), anterior to left. Etymology: The genus name includes the prefix “Eo” (dawn) in reference to the early age and basal position of this species; “typotherium” is a common suffix for mesotheriid genera. The specific epithet chico, Spanish for small, refers to the small size of the species. Occlusal view of the holotype right lower jaw, which includes four mostly-complete cheek teeth. Anterior to the left. Etymology: The genus was named by Vucetich in 1989. The species is named after Daniel Frassinetti, a Chilean paleontologist, collaborator, and friend. Occlusal view of the holotype right lower jaw, which preserves the last premolar and all three molars. Anterior to the right. Etymology: The genus was named by Ameghino in 1887. The species is named for the fossil locality where it was discovered. Reconstruction by V. Simeonovski. Copyright D. Croft. Etymology: The genus was named by Rovereto in 1914. 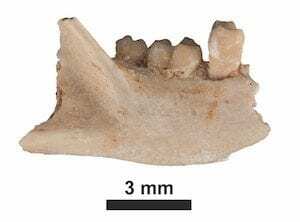 The species is named for its characteristic three-lobed last lower molar (m3). 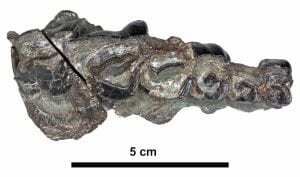 Holotype lower jaw as viewed from above, front toward right. Etymology: The genus means “false deer” in Quechua, an indigenous language of Bolivia, as this animal may have occupied an ecological niche similar to some modern deer. The specific epithet honors paleontologist Bruce Shockey, who has studied the paleobiology of native South American ungulates and worked extensively in Bolivia. Etymology: The genus name refers to the middle latitudes of South America (Meso) and to the family (procta). The specific epithet refers to its high-crowned teeth. Occlusal view of the holotype palate, anterior to the right. Etymology: The genus was named by Robert Stirton in 1953. The species is named for Federico Anaya, in honor of his contributions to vertebrate paleontology in Bolivia. Lateral view of the holotype dentary (the two teeth are m1-2), anterior to right. Etymology: The genus was named by Florentino Ameghino in 1897. The specific epithet refers to the species’ status as one of the last known members of its family. Medial view of the holotype dentary, anterior to right. Etymology: The genus was named by Florentino Ameghino in 1897. The specific epithet, which means saw-like, refers to the extra cusp on the last lower premolar of this species. Etymology: The genus name means “near Propalaehoplophorus,” in reference to a well known glyptodont from Argentina; it continues the trend of adding prefixes to Hoplophorus (See Simpson, 1980:87-88). The specific epithet means “northern” and alludes to the location of Chucal in within Chile. Left upper teeth of the holotype (photo above, line drawing below), anterior to left. Etymology: The genus was named by Santiago Roth in 1899. The species is named for Jean-Claude Vicente, a geologist who made important studies of the area in the early 1970s. Etymology: The genus means “first Archaeohyrax.” The species is named for its intermediate size relative to other members of the genus. Etymology: The genus means “first Archaeohyrax.” The species is named for its small size relative to other members of the genus. Occlusal (left) and lingual (right) views of the holotype, an isolated third molar from the left lower jaw. Etymology: “Puna” means “a high land region” in the indigenous language of the region (Quechua) and “hyrax” is a common suffix for archaeohyracid genera. The specific epithet honors Dr. Pedro Bondesio, an esteemed Argentine paleontologist. Etymology: The genus name refers to the fossil locality. The specific epithet honors Potosí, where the Universidad Autónoma Tomás Frías is located. 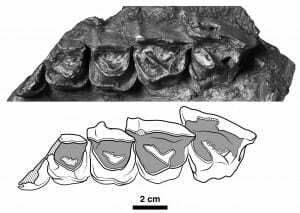 Holotype partial right upper jaw (in two pieces) with six cheek teeth, anterior to right. Etymology: Both the genus and specific epithet refer to Termas del Flaco, the small town closest to the fossil locality of Tinguiririca. 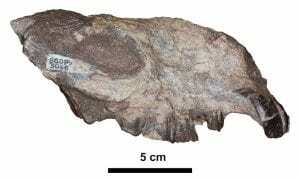 Holotype cranium of ‘Theosodon’ arozquetai, anterior toward the right. Etymology: The genus was named by Florentino Ameghino in 1887. It is in quotation marks because we are uncertain if the species actually pertains to the genus. The specific epithet honors Bethel Arozqueta of the Universidad ‘Juan Misael Saracho’ of Tarija, Bolivia, who participated in some of the first visits to the site in the last 1970s and early 1980s.